Lorelle Meets The Obsolete are a two piece from Guadalajara, Mexico. The band has release two LPs and a handful of 7″s through Captcha Records. Their latest LP on Captcha, Chambers, is out February 2014. Our friend Ryan Muldoon at Revolt of the Apes has compiled a list of 10 questions for Lorelle Meets The Obsolete in anticipation of their APF 2014 performance. Perhaps stating the obvious, one of the first things that ever caught our eye about Lorelle Meets the Obsolete was just that – the name Lorelle Meets the Obsolete. What can you tell us about the origin of this name? How has the meaning of this name evolved for your since the project first formed? Lorena: We were looking for a name that stated the interaction between two entities and didn’t want it to be as simple as Lore & Beto. So we mixed a bit of Seinfeld (Rochelle), The Twilight Zone (The Obsolete Man), the Spectrum meets Captain Memphis ‘Indian Giver’ LP and we got it. 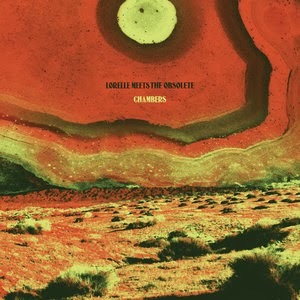 One thing we love about the unique name is that it doesn’t expose much of a hint as to what genre of music you should be pinned to – and after falling in love with your “Corruptible Faces” album, we still don’t know how to describe Lorelle Meets the Obsolete. When someone asks you, how do you describe your sound? What do you hear in the sound of Lorelle Meets the Obsolete that you don’t think many listeners have recognized? Alberto: Thank you! I’m very glad you like it. Well it depends on who’s asking. If it’s my aunt or a border patrol officer I would just say ‘rock’. But for other situations Lorena came up with the term ‘pattern music’ and to me it sums it all up quite well. All of our songs are repetitions drowned in distortion, reverb and delay. How have you seen your own musical palette expand since Lorelle first began? Can you think of any bands or albums in your world that you might not have ever been introduced to without being involved with Lorelle? Is there a particular area of musical interest that one of you has that is decidedly not shared by the other? Alberto: It has definitely expanded in a very local sense. Through the band and Captcha records we’ve had the chance of getting to know local scenes from all over the US for example. In fact, I’d say most of the contemporary music we listen to nowadays has to do with us being in Lorelle. Last year, on tour we met the amazing Disappearing People from Oakland, Bloodbirds from Kansas City and Chatham Rise from Minneapolis just to mention a few. One of the best parts of playing and having a band is listening to these precious musical gems. Lorena: We’re pretty much into the same type of music. The shortest song on the “Corruptible Faces” album – “Aging Places” – also delivers some unforgettable atmosphere to our ears, sounding a bit like a noisy, joyful funeral dirge for a robot. What can you tell us about this song? Did you set out to create a specific atmosphere? Does the song have any direct relation to the track that follows, the somber “Morning Darkness”? Lorena: Yeah “Aging Places” was the final part of “Morning Darkness” actually. Beto wrote “Morning” and one day he was locked up for hours recording it. I remember that I came home from work and it sounded completely different from what I had initially listened to because it had so much layers of noises. It was until he added vocals that I liked it. Then Alberto decided to cut the last part out, but I really liked that bit so we decided to sequence it as an intro to “Morning Dakness”. We understand that your latest album, “Chambers,” got an assist from the one and only Sonic Boom, Peter Kember? What did you learn from meeting and forging a creative partnership with Sonic Boom? How do you think the band has evolved between “Corruptible Faces” and “Chambers”? Alberto: Well we’ve only had one brief encounter with Sonic. It happened in Liverpool last September and the conversation was mainly about flat tires haha. He’s been a huge inspiration for us and he did a tremendous job with the album master so we would love to work with him in a more proximate way. Lorena: I would say the evolution, if there’s one, has been very natural. When we wrote the songs off “Chambers” Beto and I were more integrated as a band, so they came out of jams mostly and it was a really fun and laid back process. It also was the first time that we recorded with someone else and far from home, so the album has other people’s perspectives. How do you feel the environment of your youth – either the geographic location or otherwise – influences the music that you make today? Did you find yourself interested in making music at a young age? What was most difficult for you about the beginning stages of creating your own sounds? Alberto: Since I was a kid I’ve always been very fond of contemplative, repetitive and emotional sounds. “Close To You” by The Carpenters, “Rain” by The Beatles or “Zooropa” by U2 were songs that gave me certain comfort and they were all introduced to me by either my parents or my sister. I guess my parents were afraid of having a lazy kid (I didn’t do any sports) and they noticed my interest in music so they encouraged me to play the drums at age 12 perhaps but it wasn’t until I picked up the guitar that I started making music. I was probably 16 or 17 at this point and the most difficult part about creating my own sounds was to get rid of the common places found in the music exposed by the mass media. Lorena: I was much older when I started playing and back then I was more into literature. I used to write short stories and I never thought I would end up doing music. In fact my family used to say that I didn’t have any musical skills at all. Back then I used to listen to a lot of commercial stuff of all kinds. The Cure was on of my favorite bands, still is and it was until I got to college that a friend and I started to jam together and to make songs. I enjoyed it a lot because there was something very energetic about it that I was missing with my writing. Those were very musical times. I also met a lot of friends (Beto included) that gave me mixtapes and that’s how I got into many bands that I still like. It wasn’t that hard for me to write songs because through writing I was already used to translate my thoughts and feelings into something else. What was very hard was to learn how to play the guitar better. I’m still on it. What music have you been listening to lately? Do you have any recommendations for us from Mexico or beyond? If push comes to shove, what’s your favorite song by Spacemen 3 and why? Lorena: Lately we’ve been a lot into White Manna, Carlton Melton, Ttotals, Has a Shadow, Camel Heads, Father Murphy, Yeti Lane and I recommend each and every one of them. About my favorite song by Spacemen 3, well it depends on my mood, if I feel a little sad or down I like “So Hot”, if not, my favorite is “Suicide”. Alberto: I would add Late Nite Howl from Mexico, Girl Sweat and Younghusband from the UK, Bloodbirds, Disappearing People, Flavor Crystals, Chatham Rise and Dreamsalon from the US. My favorite Spacemen 3 song is “How Does It Feel?” It takes me to a very contemplative state of mind. It is just this nice feeling of hitting forever a note you like and listening to the subtle changes in every repetition. I also love the way it builds itself without reaching an exploding stage at all. When did you first hear of Austin Psych Fest? Are there any bands in particular that you are you looking forward to seeing this year? Any cool memories of your experience at the most recent Liverpool Psych Fest? Alberto: I think it was around 2008 that we first heard of APF. It seemed like a fun party hosted by The Black Angels with oil projections all over. This year we want to see Loop, Earthless, The Golden Dawn, Acid Mothers Temple and Destruction Unit of course. Besides the encounter with Sonic Boom, catching Hookworms set at Liverpool Psych Fest was a super high point. Julio Cortázar – who we believe we saw a picture of stage-diving during one of your shows – wrote the following: “Memory weaves and traps us at the same time according to a scheme in which we do not participate: we should never speak of our memory, for it is anything but ours; it works on its own terms, it assists us while deceiving us or perhaps deceives up to assist us.” Your thoughts? Alberto: That Julio hahaha… he turns into a whole different person after five shots of mezcal. Good thing there’s always someone to catch him. Lorena: One thing I love about Cortázar, and I can see it on this quote, is how he gives life and autonomy to specific human elements. Memory in this particular case. It reminds me of one of his short stories called “Don’t Blame Anyone”. In it a guy tries to put on a sweater but is deceived by one of his hands as it separates from his body to attack him. What’s next for Lorelle Meets the Obsolete? Alberto: Chambers is coming out on March 3rd, we’ll tour Europe, the UK and the US afterward. We want to record a new album somewhere in the middle and some small releases are on the works as well.